Tide was on the way up. Current just started to move, He went to see his line after sliding down a cable car rig. Suddenly he saw his line went slack. 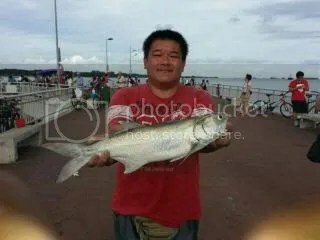 He pickup the rod and strike,,,,Heavy at the end….arrrr rubbish,,,But before his rig surface…he feel a tight jerk….Ya….a fish….when surface…wow !….grouper…. 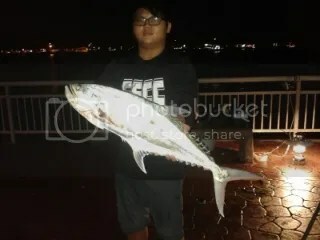 Yes…ah boi caught his last fish for year 2013 with a record….It could be the biggest grouper caught on surfcast out from the jetty. 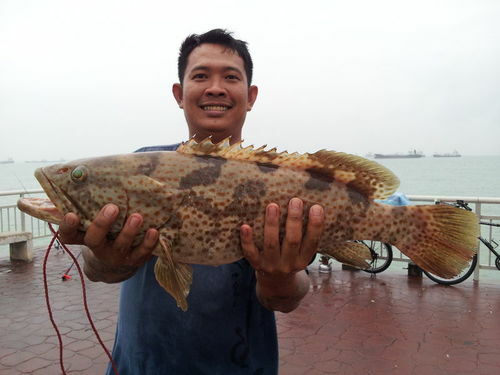 It weight 3.1kg…This mama size broke the last known biggest caught 2.5kg grouper many years back. Here we are talking about surfcast by rod out and away from the jetty and not grouper caught near or below the jetty. Ah An landed this threadfin on 21-12-2013 afternoon using kambong as bait on a long snood bottom feeder rig. Lucus caught a 2.2kg queenfish on 15-12-2013 night with a long snood bottom feeder rig.